This post is sponsored by ECOVACS. All product opinions are my own. When it comes to pet hair, this mama just can’t take it. 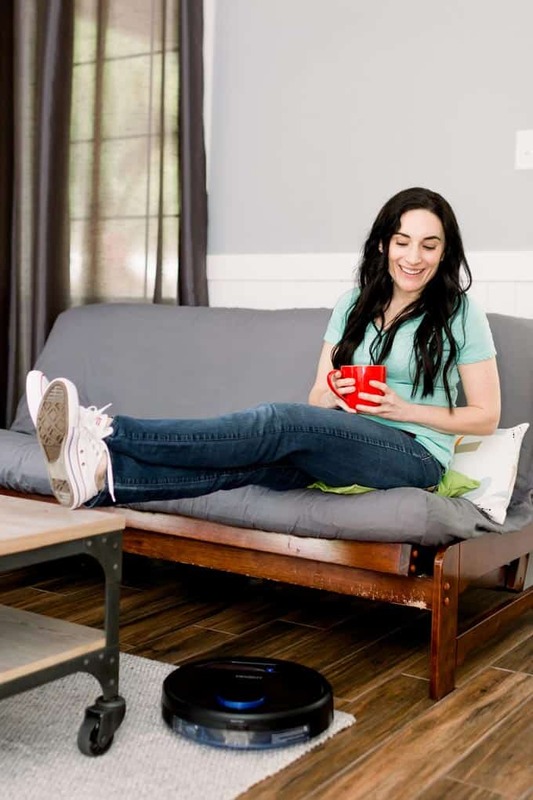 A few years ago, we had two cats, and I vacuumed every other day – anymore and my husband would have thought I was slightly crazy. 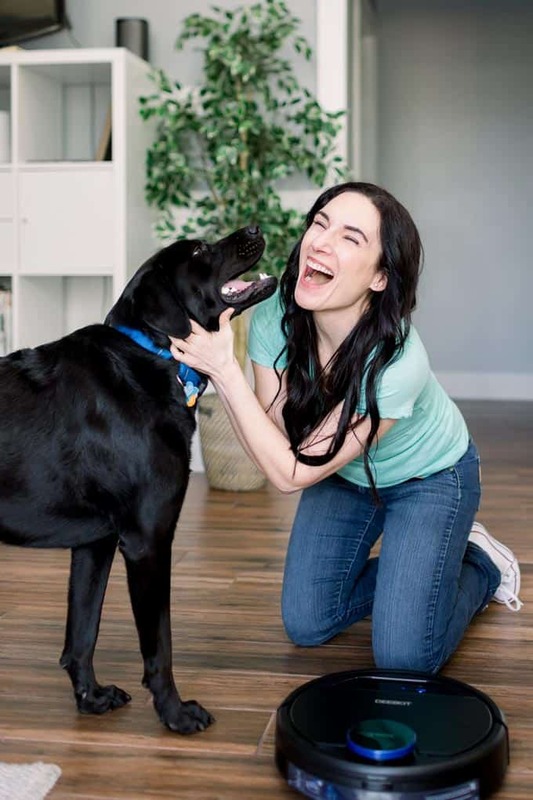 When we adopted Lucas, a sweet black lab, the thought of more animal hair in our house was almost enough for me to not agree to take him in. And then, there are the three active kids that stomp through the house and don’t always take off their shoes from being outside –and when they do, they leave them in the middle of the kitchen. They trail more dirt in than the dog does from his walks and don’t even get me started on when they grab snacks – it’s crumbs everywhere. Until I found the ECOVACS DEEBOT OZMO 930, the first robotic vacuum that can change cleaning modes based on its current function. It not only vacuums our pet hair and crumbs; it also detects non-carpet areas when in the mopping mode. 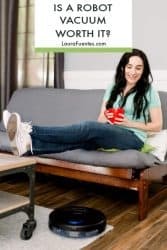 Doing research on robotic vacuums can be a bit intimidating but when it came to it, I trusted Consumer Reports when it came to choosing to an ECOVACS unit. Smart navigation mapping. This technology enables the DEEBOT OZMO 930 to navigate and map your floor plan. 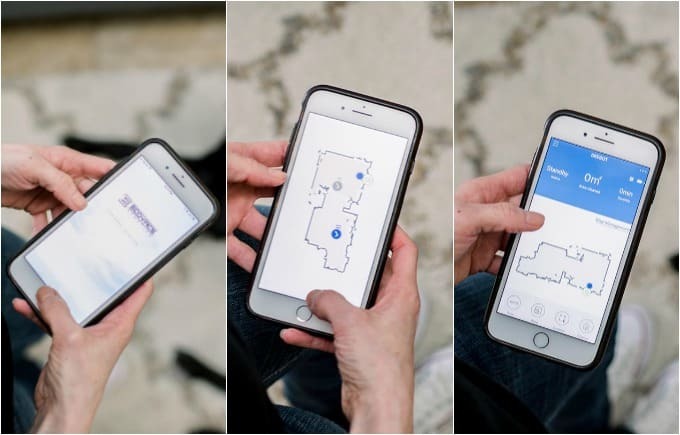 The map is interactive allowing you the freedom to customize where you want the vacuum to go, it allows you to draw virtual boundaries or pinpoint specific areas to clean or avoid. Mopping: The DEEBOT OZMO 930 has an integrated mopping system which conveniently mops your hard floor even as the DEEBOT vacuums. Carpet identification. 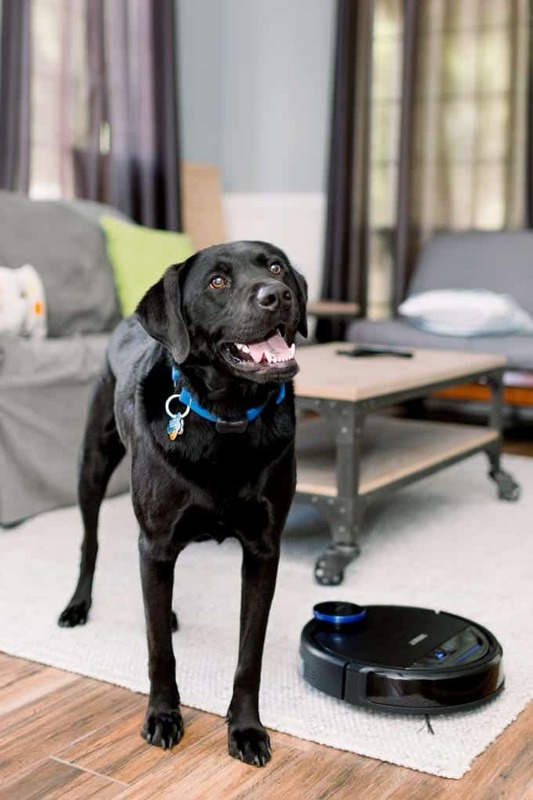 The DEEBOT OZMO 930 can automatically identify your floor type boosting its suction on carpets and avoiding carpets when mopping. Adaptive floor sensing. 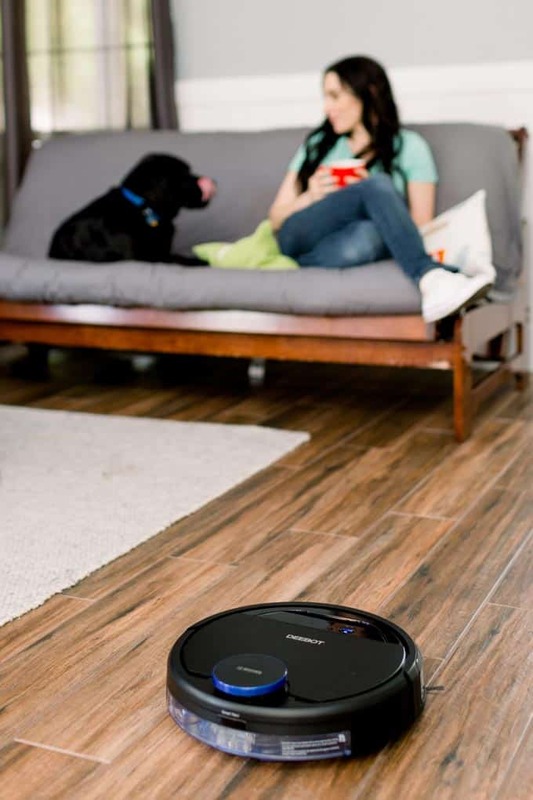 With ECOVACS’ latest Adaptive Floor Sensing technology, the DEEBOT OZMO 930 will change its cleaning pattern on the fly depending on whether it is in vacuuming or mopping mode, all without intervention. On carpet, the DEEBOT OZMO 930 will increase suction power automatically for a deeper cleaning. App enabled. You can start, stop or charge your DEEBOT OZMO 930 with Amazon Alexa and or Google Assistant. A voice reporting feature provides you with real-time updates. You can also see a map of your house as the robot sees is and identifies areas of cleaning. At first, I thought I’d get a robot vacuum to just take care of the vacuuming but after a little research and thinking through it a bit more, the option to have the robot mop too was very appealing. I mean, if you’re going to buy a robot vacuum unit to save you time from vacuuming, why not have it do both? In this mama’s mental load, housework and chores can typically take up a good chunk of time each week. And it can sometimes feel like I can’t keep the house clean with three kids (and their friends), a dog and a cat, no matter how many mopping and vacuuming sweeps I do. As a full-time working mom, I can’t vacuum during the day either, I’m that crazy person that vacuums after dinner before the kids go to bed a few times a week; because after two days, I can see dust balls starting to form throughout the house. While everyone wishes they could just hire someone to do the weekly cleaning for them, that’s just not possible for everyone. Plus, when I asked most of my friends what household chore they’d want to delegate first, the bathrooms topped the list. Not for this gal, when you have 3,000 square feet of flooring, vacuuming and mopping were at the top of my list of things to offload. 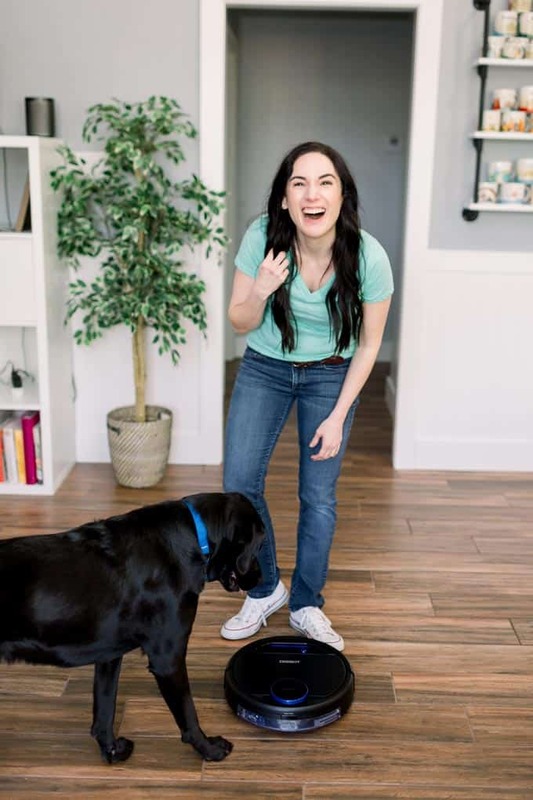 With my new ECOVACS DEEBOT OZMO 930, vacuuming and cleaning my floors are now off my list! Thanks to my DEEBOT, I’m saving about 3 hours of housework per week and thanks to smart technology, I can program it to do the cleaning cycles when we’re not home. I have had shedding white terrier rescue mutts since 2004, and recently lost one. However, I was a foster failure, so I added a reddish Beagle mix to our home and now have 2 shedding dogs that leave their personalities all over. I also have 2 busy girls, and am very active in being outside working out, running, etc, as well as working full time. I have no time to keep my house up, and the dog hair is atrocious! Being I’m now a single mama as well, hiring for help is not easy to do. I’d love to have this help me out!!!! OMG I have 3 cats and a dog on the way and a kid who LOVES glitter. Going to move to a bigger house for us all to fit better inl I can’t vacuum due to neck and back injuries so I have someone come help once every 2 weeks which as you know, is definitely not enough with all those animals! HELP! Would love this!